Faraday Future CEO Jia Yueting will lower his salary to $US1 as some members of the automaker’s leadership team decrease their salaries by more than 20%. A Faraday Future representative told Business Insider that it will reduce the wages of hourly and salaried employees by 20% while laying off an undisclosed number of workers. Faraday Future CEO Jia Yueting will lower his salary to $US1 as some members of the automaker’s leadership team decrease their salaries by more than 20%, the representative said, adding that the pay cuts are temporary and the automaker hopes to reverse them once an unspecified amount of funding becomes available. “Yesterday Faraday Future announced a plan to realign its business objectives to ensure the continuance of its operations due to Evergrande’s failure to live up to its end of the bargain and make the payments it agreed to. Given the situation, the Company has reviewed its short-term operating plans to identify ways to manage expenses and protect the long-term future of FF,” the company representative said. Earlier this month, a filing on the Hong Kong stock exchange first reported by Reuters said Faraday Future was attempting to cancel a $US2 billion deal that would give a 45% ownership stake to the Chinese healthcare company Evergrande Health Industry Group. The Verge reported that the automaker was struggling to pay vendors after spending the first $US800 million Evergrande had planned to invest in it. 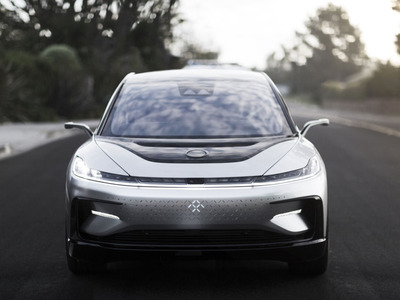 Evergrande’s filing said Faraday Future asked for a $US700 million advance on the remaining $US1.2 billion of Evergrande’s planned investment and entered into arbitration to cancel all its agreements with Evergrande after claiming it had not received the payment. Evergrande said in the filing that Faraday Future had not met the terms necessary to receive the funding. In a statement, the automaker said it had met the required conditions to receive the advance payment and was attempting to terminate its deal with Evergrande as a result of Evergrande’s failure to provide the promised funding. Faraday Future also alleged that Evergrande has prevented it from receiving funding from other sources. Yueting, who’s also the founder and chairman of the Chinese tech company LeEco, last year had $US182 million in assets frozen by the Chinese government because of unfulfilled loan payments.